First mix all the dry ingredients together for the pitha. Then place about 1½ cup of hot water in a pot and add the dry ingredients. Combine with the water and add the remaining hot water one spoon at a time until it begins to form a dough. Now take the dough and place it in a bowl or rolling mat and knead the dough well. Be careful, the dough will be hot so don’t burn your hands. Let it cool down until you can handle it, which happens pretty fast so don’t walk away. And now once the dough is ready, coat the rolling surface with a little oil to prevent it from getting stuck. Then roll the dough to about a ¼ inch to 1/3 inch thickness and cut into shapes. You may use cookie cutters to cut them and make designs on them using anything you fancy from knives to tooth picks to fondant tools. Ensure the design is deep enough as they will help absorb the syrup and make the inside of the pitha moist. And now heat enough oil to deep fry the pithas. When oil is heating, make syrup by combining all the syrup ingredients in a saucepan and heat until sugar melts and the desired consistency is achieved. 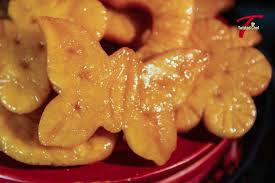 Now fry the decorated pieces until golden color and remove them from the oil. Ensure that all the oil has been drained from the pieces and place them directly in the hot syrup. Then at the same time make your syrup to a little thicker consistency than simple syrup but not too thick. Once the desired consistency is achieved, reduce the heat to a low setting to keep the syrup hot. There should be enough syrup to submerge all of the pitha pieces. Keep the pieces in the syrup until the pitha are moist inside to your liking. Finally serve this Moog Pakon pitha any decorated plate or bowl.